Country music has always been one of the most popular genres in America and its importance in the development of music can not be under estimated. Many great performers cut their professional teeth on country music, as can be seen here. 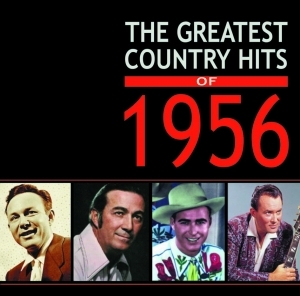 This collection of the finest country hits to appear in 1956 shows that it many great names in Rock and pop were heavily involved in the country scene. The track list is packed with the greatest names in music, including early Elvis, Johnny Cash, Marty Robbins, Jim Reeves, George Jones and established country stars such as Hank Snow, Red Foley, Carl Smith, Webb Pierce, Faron Young and many more. Many of the titles were re-recorded later in either styles but their country origins are here for all to see. The package is complete with a fully illustrated booklet giving details of each track in detail.